For those looking for a rock solid edc knife with a sub 3″ blade, the Benchmade 14210 may be just the ticket. This knife is part of Benchmade’s Heckler and Koch (HK) line, which is a partnership between the two companies where the knives are made by Benchmade and branded with HK insignia. A number of interesting designs have emerged from this line, all with a no-nonsense tactical feel. The HK 14210 is no different although this time Benchmade teamed up with custom knife maker Mike Snody to give us a really unique looking blade. For purposes of this review I am mainly examining the 14210 from an EDC knife standpoint. With a blade just under 3″ this knife could work well in areas requiring a smaller knife that doesn’t compromise strength and performance. I think the 14210 could function as an emergency tactical knife as well due to its stout design. The 14210 has a blade length of 2.95″, an overall length of 6.80″ and a weight of 3.08 ounces. 3 ounces for an EDC knife is very reasonable, and the 14210 has a pleasant “heft” to it in hand. For those interested in, say, a Benchmade Griptilian but are looking for something a little more unique and exclusive this knife might fit the bill. The 14210 uses the same 154CM stainless steel as the Griptilian. As I have mentioned in other reviews, 153CM is a very good high end blade steel known for it’s all-around performance and good corrosion resistance. Where the Snody 14210 departs from the Griptilian is with its very unique blade shape. This is a modified drop point blade, defined by a long swedge, a slight recurve and a hollow grind. The recurve makes the smaller sized blade cut like a bigger knife and I was pleased with how razor sharp this knife came out of the box. I also liked the grey finish on this knife; it wears well and looks good. This handle is a minimalistic open, pillar style construction and has sculpted G10 handle scales over 420J stainless steel liners. The liners have been milled out and help keep the weight of this stout blade manageable. This is a very simple handle design but it feels very strong. The ergonomics on the 14210 are very nice for a smaller blade. The G10 scales are sculpted and a pattern of lightly textured lines run down the length of the blade. This texturing could be improved to provide a better grip, but I think it’s fine for most EDC tasks. There is a nice thickness to the handle and the edges of have been smoothed for a more comfortable grip. There is a large thumb ramp on the top of the blade with very aggressive jimping. That thumb ramp works really well with the shallow choil, providing excellent control over the knife. While this isn’t the most innovative handle shape I have seen, it certainly does the job here. The pocket clip is a simple, unbranded Benchmade clip finished in a flat black. This is the “arrow” clip common on a lot of Benchmade’s knives. The clip allows for ambidextrous tip up carry and is retained with 3 sturdy screws. 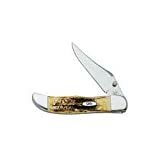 The retention is good and the clip is mounted high so that the blade rides low and unobtrusively in your pocket. All in all I am very pleased with this clip. The HK 14210 has Benchmade’s patented axis lock technology. The Axis lock is wonderful and it works flawlessly here. My deployment was a little stiff out of the box, but after breaking the lock in a bit it has really improved the deployment. The blade is fairly thick and heavy so it really builds some momentum and flings the blade out. I really feel that with a knife like this, you really don’t need an assisted or automatic knife. One handed opening is fast and easy, and it’s just as easy to close this knife one handed as well. The fast deployment and the axis lock are major features of the knife. The 14210 is a great folding EDC knife with a sub 3″ blade. 154CM steel, a rock solid handle, smooth deployment and solid axis lock all make this a great knife to consider carrying. The size and weight are other pluses that make this a great EDC option. I find the axis lock and full liners to make this knife extremely durable. The overall quality and attention to detail created an extremely loyal following for the Benchmade HK 14210. This is definitely one of my favorite Benchmade knives…..